Clark (left) and comedian Brian Posse (center). 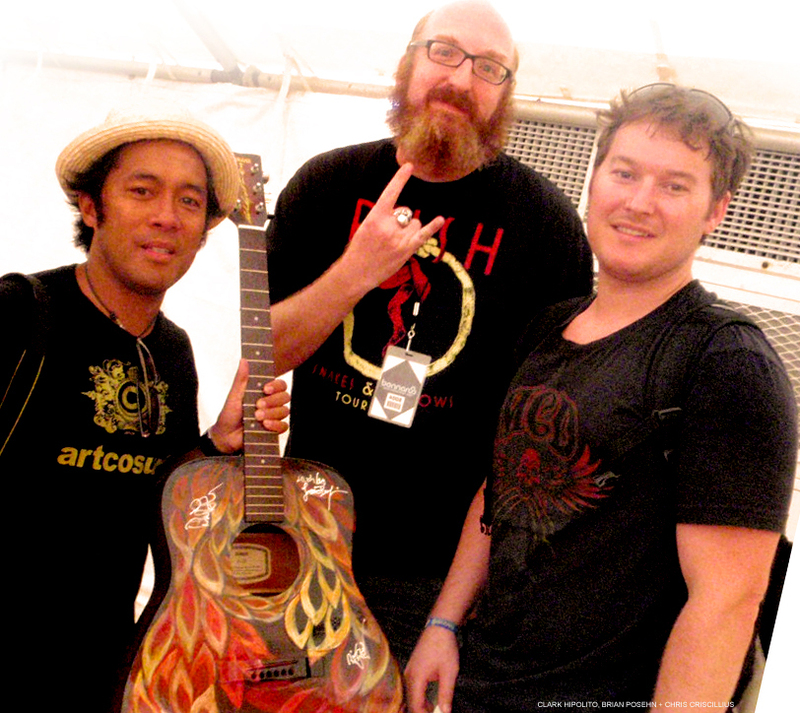 July 7, 2008 (SAN DIEGO, CA) — It took four days of literally running from one backstage area to another, but by the time the Bonnaroo Music Festival in Tennessee was over recently, Line Up Magazine and artist Clark Hipolito had snagged an impressive assortment of performers’ autographs on an acoustic guitar the artist had hand-painted. That guitar was auctioned off on June 26 during San Diego’s “Rocksta” celebration, sponsored by Line Up Magazine to benefit SURFAID International and “The Land of Plenty” (LOP) skateboard foundation. “It was insane trying to get to all those guys,” Hipolito said. “Bonnaroo is a huge festival, so we were constantly running from one stage to another. But it was definitely worth it,” Hipolito said. His company, ArtCo Surf, was one of the sponsors for “Rocksta,” a music, art and fashion event to be held in Hard Rock Hotel’s rooftop Moonstone Lounge. The artist was also on hand to hand-paint one of his signature surfboards right there on the rooftop. Bands who performed on the rooftop were Sashamon, The B Foundation and The Dirty Heads. La Isla Couture presented swimwear fashions on a catwalk in 10-15 minute intervals along with Surf Prescriptions’ surfboards and clothing by Jeff “Doc” Lausch. The art exhibit and silent auction rounded out the event. SURFAID (http://www.surfaidinternational.org) is a non-profit humanitarian organization dedicated to improving the health and wellbeing of people living in isolated regions connected to through surfing. LOP (http://www.thelandofplenty.org) is a non-profit skateboard company that encourages skateboarding as a creative form of physical education and artistic expression for at-risk youth. For more information on “Rocksta,” contact Line Up Magazine at 910-509-0572 (http://www.lineupthemag.com) For more information on Clark Hipolito and ArtCo Surf, visit http://www.artcosurf.com.